Ah, the clove hitch. It’s a simple way to attach a rope to a pole, it’s side-to-side adjustable and is frequently used to start and finish a variety of lashings. Some folks don’t like it because in various applications, it’s not the most secure or reliable choice. But, in those instances, there are numerous alternatives. See the following photos—all close clove hitch relatives. The clove hitch is one of the most-frequently-used knots Scouts learn, so common, yet it can also be very elusive, especially when it comes to completing certain lashings. In the knot-tying universe, the clove hitch is a whole lot more prevalent than most of us realize, and it can be tied in a variety of ways and from a variety of different perspectives. Of course they’re all Clove Hitches! Starting from the right and proceeding the the left. / Starting from the left and proceeding to the right. Form a right underhand loop and place it over the pole. Form another right underhand loop and place it over the pole (on top of the pervious one). When preceding from the right, instead of right underhand loops, form left underhand loops. Without being informed, one can just look at two of these half hitches and see they look exactly like a clove hitch. Of course, that’s because these two half hitches are a clove hitch. Throwing two half hitches over the open end of a vertical pole is the hands down, quickest way of tying a clove hitch, After you’ve done it for awhile, it takes about a second. A common way to refer to this approach is to call it an “Open-Ended Clove Hitch.” It’s exactly what the doctor ordered when you need to tie a clove hitch over the end of a spar. It’s also the only way to tie a clove hitch in the middle of a long line, like when securing a hand rope on the top of an A-frame during the construction of a Double A-frame Monkey Bridge (unless you want to pull foot after foot of rope through the hitches because you’re using an alternate method, or… you just don’t know any better). 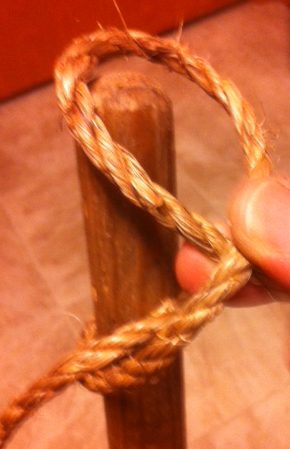 It’s really surprising how many folks, old and young, aren’t familiar with this simple method of tying a clove hitch. Here’s an amusing illustration: A young Scout was competing at a camporee for the best time in completing a Rope-Toss-Log-Lift Challenge. After throwing the rope over the crossbar and tying the end to a log with a timber hitch, the third step is to secure the other end of the rope to a stake in the ground with a clove hitch. Ah! An open ended pole! 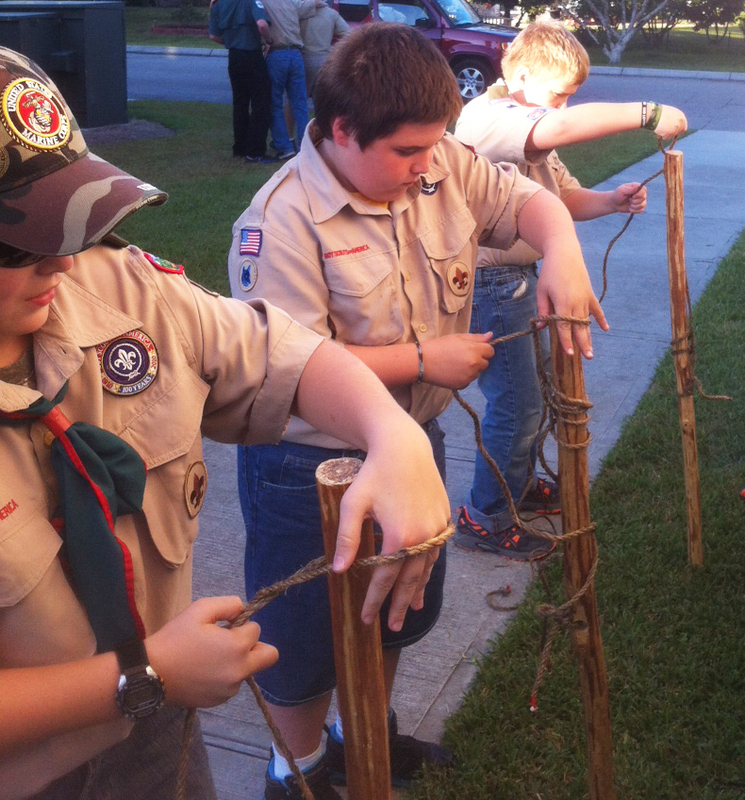 So, this young Scout completes the first two steps, runs over to the stake and, bam! He ties an Open-Ended Clove Hitch over that stake in nothing flat. The jaw of the Scouter conducting the event drops down. With mouth open and a look of bewilderment on his face, he leans down, scratches his head, and examines the knot. Yes, to his surprise, indeed it’s a clove hitch! This skinny, young Scout did something the adult had never seen before, and the old guy was astonished! Finishing a Lashing with Two Half Hitches. Here’s the story: When you learn how to do this, number one, it’s faster. Number two, it’s also easier to securely finish off the frapping turns, because it’s a cinch to snug both half hitches in close and pull them real tight, which is definitely something you want to do. 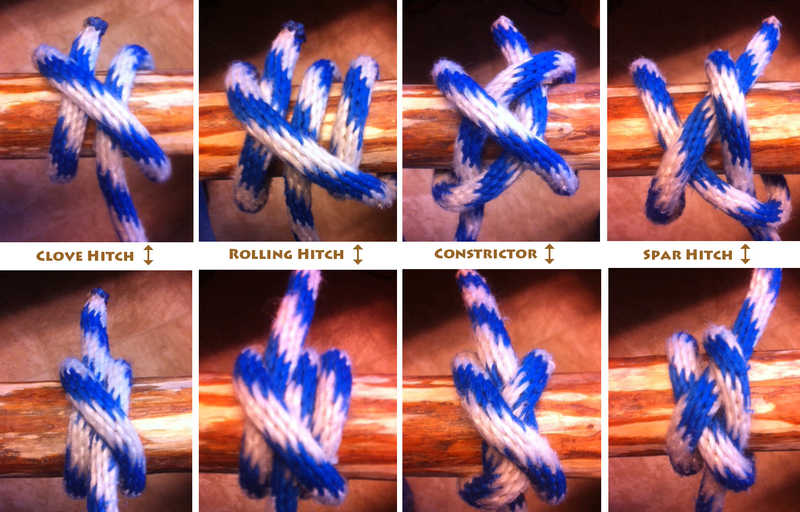 1/2 HITCH + 1/2 HITCH = CLOVE HITCH —> WATCH AND SEE! I have been teaching the technique of finishing the lash as you describe for several years now. Until now, I thought I was alone. I use a lot of the motivations you describe, but some are new to me. Some scouts get it. Some are so concerned that they do it as the handbook shows that they are stunningly resistant. Nice article — I will use when my explanations seem to be failing. Thanks.